Stems: Erect, stout, much branched, with spiny wings. Leaves: Alternate, simple, glabrous to sparsely or densely hairy on the veins below; margins deeply serrated to pinnately lobed; veins extend beyond margins as spines; basal leaves form rosette of lanceolate to broadly elliptic blades, 6 to 20 inches long; margins often whitish; upper stem leaves lanceolate, 1/2 to 6 inches long; sessile or clasping. Inflorescences: Heads, solitary, 1.5 to 3 inches in diameter, hemispheric in shape, often "nodding" at maturity, terminating branches. Flowers: Involcural bracts lanceolate, 1/2 to 1 inches long, in several series, overlapping; tips spreading or reflexed, with spines; ray florets absent, disk florets slender, tubular, rose, pink or purplish, to 1.2 inch tall. Fruits: Achene, glabrous, oblong, 1/8 to 1/5 inch long, with longitudinal lines; pappus of numerous hair-like bristles; bristles up to 4/5 inch long, joined basally. Habitat: Pastures, prairie ravines, open woodlands, waste areas, and fertile lowlands. Distribution: Principally in the east two-thirds of Kansas. Origin: Native of southern Europe; imported into the U.S. for floral gardens in the early 1900's. Escaped and now widespread. 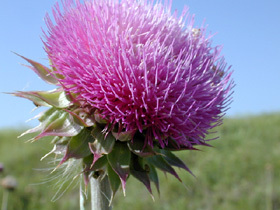 Comments: Carduus is Latin for "thistle" and nutans comes from Latin "nodding", in reference to the flower heads. Musk thistle is an official noxious weed in many locales, because it spreads quite rapidly and forms dense stands that crowd out other vegetation. It should be destroyed when found. Musk thistle is most easily controlled when in the rosette stage, prior to bolting. The plant can be sprayed or dug, but if flower heads are present, they must be removed and burned. I have observed musk thistle plants that have been dug still produce seed. When digging, the root should be cut below the crown and the stem chopped into pieces.